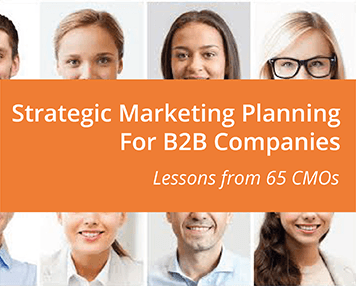 Their lessons and suggestions are compiled in our latest whitepaper, “Strategic Marketing Planning for B2B Companies- Lessons from 65 CMOs” where we grouped their advice into 10 lessons. The most important piece of advice, remember your customer, is the core of every marketing plan. Many companies get so wrapped up in their own business and revenue objectives that they forget to ask customers about business challenges, pain points and goals – or to validate new ideas or products. One of our favourite strategies to remember the customer is to build ideal personas. These should be at the core of every marketing plan. Customer personas guide how you go-to-market, including what features and benefits you promote, the content you create, the topic, the tone, frequency and as well as how you communicate. A tactic we find invaluable for learning more about target personas are customer focus groups. These provide critical insights into customers and prospects, helping you to build personas that are authentic to your business. Here are some quotes from our esteemed marketers around customer focus. These marketers embrace something that is critical to success-customer focus. Learn what else they embrace! Download our whitepaper now.